The COPs squad competing in national championships in Sheffield. City of Peterborough Swimming Club (COPs) officials are beaming with pride at the number of their members who have qualified for the Summer British and English National Swimming Championships. There are just 123 swimmers in their main programme, but a remarkable 34 have reached the ‘Nationals’ which take place at Ponds Forge in Sheffield over the next week. What makes this a fantastic achievement is that this the process of qualification this year was based on rankings rather than time, a change introduced after Team GB’s poor showing at the 2012 Olympics. 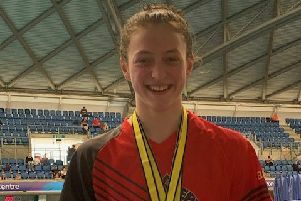 COPS’ 20 individual qualifiers for this year’s Summer British Championships are; Mollie Allen (16),Katie Brown (15), Chloe Hannam (18), Daniel Powell (17), Lauren Harrison (14), Hanna Jaszkiewicz (15), Mia Leech (12), Daniel Leigh (16),Cameron McRae (15) Amelia Monaghan (13), James Newton (17), Harvey Norman (14), Poppy Richardson (13), Leah Roughan (15), Bethany Saunders (15), Maddison Saunders (13), Jamie Scholes (15),Tyler Thomas (13), Rachel Wellings (15) and Thomas Wiggins (15). Finn Corbett (14) will be competing in the relay events. In addition COPS 11 qualifiers for the Summer English National championships are; Anna Blakeley (12), Sophie Crowther (13), Taylor Goodby (17), Joshua Graves (17), Matthew Gray (15), Holly Jaszkiewicz (13), Daniel Powell (17), Aisling Ruff (17), Jaxon Simmons (15), Joe Welch (14) and Christie Woods (14). Lee Clarke (17) will be competing in the relay events. Also competing in the Open Water Championships will be 12-year-old Jade Goode, while Ross Wisby (29) will be competing in the Masters event. COPS is the highest ranked club in the East Region and ranked 13th in the country – and all the clubs ranked above them are feeder or University programmes who are able to draw on talent far beyond their immediate geographical area.